Firefighters have a wide range of options for salary compensation, depending upon education, experience, and job location. Most firefighters have a high school diploma, and entry-level positions can start with volunteerism — especially in small towns or rural areas. For a serious look at a fire-fighting career, an individual needs to acquire at least an associate’s degree in fire science and work for a company that pays its employees, mostly in urban areas, as job location has an impact on your potential salary. Paid firefighters held about 310,400 jobs in 2008, which means that, in 2009, there were more residential fires than there were firefighters. That number did not include volunteers, however, and volunteers often make up a large portion of rural and small town fire companies. Still, the demand for firefighters is increasing as populations increase. Fire fighting is strenuous and tedious work, as employees or volunteers often live at fire stations during shifts and must keep equipment clean and functional. Between alarms, firefighters practice skills and may perform fire inspections. A work week often consists of 50 hours, and shifts often can be longer and more varied than the hours of workers in other occupations. Volunteers also spend some time in training to learn how to handle equipment, how to extinguish fires, and how to manage medical emergencies. The threat of coming in contact with hazardous materials requires the use of heavy protective gear, so fire fighters also must be fit enough to wear this equipment and remain agile. The paid employee’s average hourly salary in 2008 was $21.97; however, supervisors and managers earned approximately $34.07 per hour, and fire inspectors earned an average of $26.37 per hour. 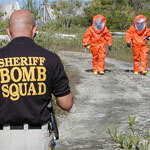 Other jobs within this occupation include fire jumpers, fire marshals and fire investigators. These jobs require special training, and people who acquire these jobs often work for metropolitan areas. An estimated 81,070 firefighter injuries occur annually in the United States. 49 percent of firefighter injuries occur on the fire ground and six percent occur while responding to or returning from a fire incident. Overexertion/strain is the leading cause of fire-related firefighter injuries at 25 percent. 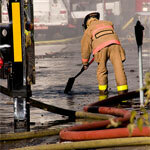 38 percent of all fire-related injuries result in lost work time. The majority of fire-related injuries (87 percent) occur in structure fires. 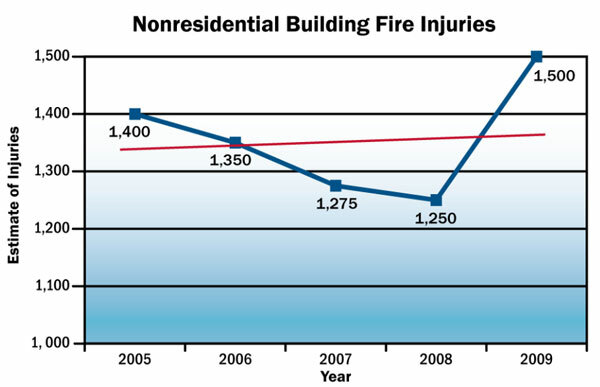 On average, structure fires have more injuries per fire than nonstructural fires. 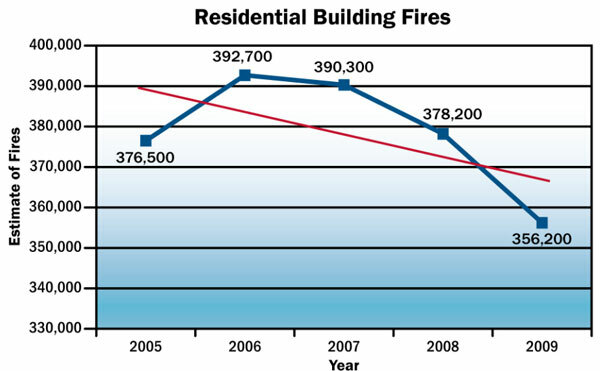 Fires causing injuries are more prevalent in July (10 percent) and peak between the hours of 2 and 5 p.m. While firefighting is hazardous work, people usually apply for these jobs to protect their communities and out of a desire to help others. Often, firefighters come from families of people who have served in this profession. But, there is no need to start on the bottom floor. Education often serves as a springboard to help entry-level graduates achieve leadership status. Most experienced firefighters continue studying to improve their job performance and prepare for promotion examinations throughout their careers. Opportunities for promotion depend upon the results of written exams, as well as job performance, interviews, and seniority. To move up to positions higher than battalion chief, many fire departments now require a bachelor’s degree, preferably in fire science, public administration, or a related field. An associate’s degree is required for executive fire officer certification from the National Fire Academy (NFA). An education in fire science increases the chance that entry-level positions will pay more and that the graduate can move into higher-level positions. An associate’s degree in fire science can open chances to work with a fire company in larger cities, where salaried positions are more common. Entry-level employees in large fire departments are trained for several weeks at a department’s training center or academy. 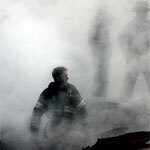 Recruits study firefighting techniques, fire prevention, hazardous materials control, local building codes, and emergency medical procedures, including first aid and cardiopulmonary resuscitation (CPR). They also learn how to use a department’s equipment. After they successfully complete their training, they are assigned to a fire company during a probationary period. One way to advance in this field is to take advantage of the training as a certified emergency medical technician (EMT). Almost all departments require that their firefighters have this training, even if at the lowest level of certification. But, further education in EMT and paramedic training can provide entry-level admission into larger fire departments in metropolitan areas, where salaries can compensate for that education. Some attend training sessions sponsored by the NFA that cover topics such as executive development, anti-arson techniques, disaster preparedness, hazardous materials control, and public fire safety education. Some fire departments offer incentives such as tuition reimbursement or higher pay for completing advanced training. Students can also obtain some instruction through distance learning at NFA. There were about 365,600 paid positions in this field in 2008; firefighters held about 310,400 jobs, and first-line supervisors and managers held about 55,200 jobs. These employment figures do not include volunteer firefighters, who perform the same duties and may constitute the majority of firefighters in a residential area. According to the U.S. Fire Administration, about 70 percent of fire companies were staffed entirely by volunteers in 2007. Employment in this occupation is expected to grow by 19 percent by 2018, which is faster than the average for all occupations. Most job growth will stem from volunteer firefighting positions being converted to paid positions. In recent years, it has become more difficult for volunteer fire departments to recruit and retain volunteers, perhaps because of the considerable amount of training and time commitment required. The hierarchy structure, which culminates in the fire chief’s position, can vary from department to department; however, the NFA is working to help states consolidate fire departments to increase fire company size and to help with consistent training nationwide. Education counts…as fire chiefs and their deputies often have bachelor’s degrees in fire science. Currently, a firefighter can find higher salaries in cities rather than in rural regions because of the demand for more fire protection in more populated areas. Additionally, larger cities seek experienced individuals who are experts in fire as well as in hazardous materials and in any first-responder skills. Emergency management requires more knowledge than how to put out a fire or decrease the chances for a fire; educated first responders also know how to treat emergency situations from terrorism to tidal waves. Becoming a firefighter affords many opportunities for advancement. A combination of experience and education is typically required to move ahead in this field. While passion to help the public may outweigh the monetary concerns, a little planning could lead to a comfortable lifestyle along with a job that fulfills a dedication to this field.